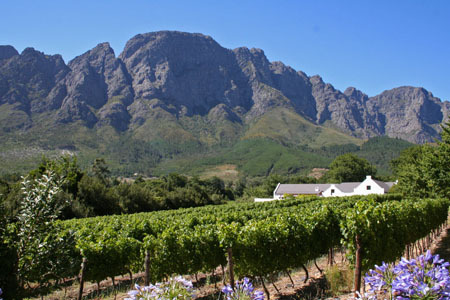 In terms of drawing an international audience, it seems that the South African wine industry got off on the wrong track. For a number of years it has promoted as its flagships wines two generally flawed varietals that poorly match with food— the pinotage, usually a rather earthy, dark red product, often showing a whiff of unpleasant acetone, and a generally unbalanced, flabby, pale white chenin blanc. So, with very little well-organized group marketing or educational effort in the U.S., it’s not surprising that many shops provide so little shelf space for South African wines. A growing group of vintners are, however, following a new path, with emphasis on chardonnay, syrah, pinot noir and Bordeaux-like blends. Based on extensive tastings during a 3-week visit to the country, I found that many bottles now produced in South Africa are well-priced gems. Discussed below are seven noteworthy producers who are following, or at least veering, towards this new path. Their wines can be found in the U.S., although some local hunting and special ordering may be necessary for particular bottles. Prices listed are average U.S. retail cost. 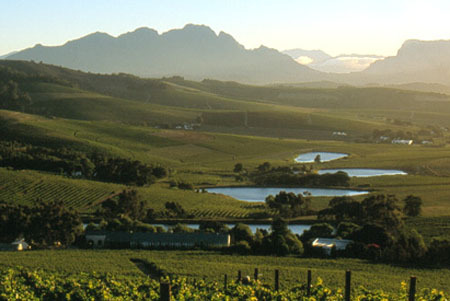 Founded in 1975 by the father of present-day owner, this winery is located in the Hemel-en Arde (Heaven and Earth) Valley on the southern coast of the Western Cape. Here, cool breezes from the Atlantic Ocean allow for ideal ripening conditions for the chardonnay and pinot noir grapes grown on the 128-acre clay-rich soil estate. Also, with production limited to 15,000 cases annually (half chardonnay and half pinot noir), great attention can be paid to harvesting and vinification, with innovative techniques put into practice, such as maintaining delicacy and freshness in the relatively low alcohol chardonnays (around 12 percent) by aging a portion of the fermented juice in specially made, large clay amphorae rather than in oak barrels. Based on a tasting of pinot noirs from 2009 through 2012 and chardonnays 2010 through 2012, I found the the results are well worth the effort, with first class Burgundian-like wines. For example the 2009 Pinot Noir was reminiscent of a Clos du Tart, with a bouquet and taste of cherries and spice; the 2011 Pinot Noir ($30) was similar in style to a Volnay, with a memorable taste of raspberries and herbs. And the chardonnays, particularly the 2011 ($21), could easily be mistaken for Puligny-Montrachets, with a dry, crisp taste and smooth, elegant minerality in the finish – great to mate with the likes of lobster, shrimp and scallops. While much of the South African cabernet sauvignons I’ve tasted show a distinctively annoying metallic aftertaste, not so with wines made from this varietal produced at Jordan. For example, the 2009 Cobler’s Hill, 58% cabernet sauvignon, 42% merlot ($40), has a dry, well-balanced flavor of cassis and cherries with chocolate in the finish, and the 100 percent cabernet 2010 Jardin Range ($18) has a deep ruby color, with a bouquet and taste of ripe blackberries and a hint of vanilla. Clearly the great bouquet and flavor achieved in the cabs and cab blends produced here are a combination geography and enological skills. Like many of the best California Cabs, all grapes are grown on cool hillside vineyards, and proprietors Gary and Kathy Jordan are graduates of the UC Davis Wine School Program. Their chardonnays are no less grand cru-like, with the 2011 Nine Yards Chardonnay, 100% chard, aged primarily in new French oak barrels ($30), showing a rich taste of citrus and pineapple with vanilla on the finish; older vintages reveal complex flavors of herbs and butterscotch. Also, the soft, fruity 2009 Prospector Syrah is a great choice to drink with barbecue fare like ribs and grilled salmon. So as not to confuse the consumer between the Jordan winery in California and that in South Africa (and by mutual agreement with the producers), the Jordan South Africa wines are sold under the Jardin label in the U.S. 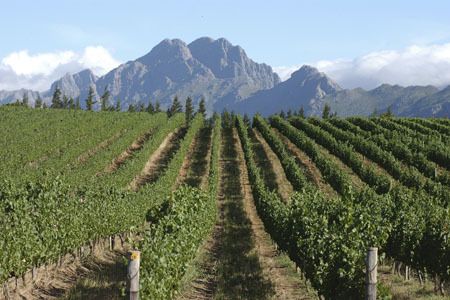 While a number of South African producers only make wine from estate-grown varietals, this vintner’s philosophy is to make a wide range of sensibly-priced, fruit-driven wines by primarily using purchased grapes, And based on the spectrum of top-notch wines tasted here, this approach is working quite well. An excellent 2012 Sincerely Sauvignon Blanc (a bargain at $12) had a classic bouquet of newly mown hay and a taste of citrus, gooseberries and herbs with a touch of sweetness in the finish— a perfect wine to go with boiled or broiled shrimp or raw oysters and mussels. A 2011 Neil Ellis Chardonnay showed a bouquet of apples and pineapple and a rich, lemony flavor with hints of butterscotch ($18), ideal to mate with grilled swordfish or tuna. The easy drinking 2010 Grenache ($28) had a complex bouquet and taste of ripe cherries, raspberries and chocolate, and the 2010 Syrah ($13) showed a bouquet and taste of blackberries and ripe plums with a long slightly tannic finish— an excellent wine to accompany beef, lamb and mild cheeses. While this property produces some excellent wine, much of what seems to be available in the U.S. is the lower end “Petit” brand (chenin blanc, pinotage and merlot), which, even at $11 a bottle, leaves a lot to be desired in bouquet and taste. And while the Ken Forrester Old Vine Reserve Chenin Blanc ($13), aged in oak barrels for nine months, is a bit more aesthetically pleasing, with a bouquet and taste or ripe peaches and melons, I found the finish somewhat bitter. However, if you can find them, go for one of the two excellent blends of grenache and syrah— the 2007 Renegade ($18) that shows a bouquet and taste of ripe plums and herbs or the 2009 Gypsy ($55) that has a complex bouquet and taste of ripe fruit and spice with hints of anise in the finish, ideal to match with lamb and beef. Little known in the U.S., this winery (its name meaning “rest and peace”), annually produces 10,000 to 15,000 cases of top-notch wine from estate-grown grapes. The 2009 Estate ($36), a blend of 60% rich, ripe cabernet sauvignon, toned down by 20% syrah and 10% merlot shows a cassis nose, very fruity flavors of blackberries and cherries and a long lasting finish. It pairs particularly well with lamb and game. And based on tasting the 1996 Estate, expect this wine to become richer and smoother with a few years of bottle age. Also needing a few years of bottle age is the 2010 Cabernet Sauvignon ($25), with a bouquet and taste of cedar, chocolate and ripe blackberries and a bit of tannin in the finish. Not for the faint-of-wallet, the 1694 Classification ($110) is blend of syrah (57%) and cabernet sauvignon (43%) grown in deep red, granite-laden soil and aged in French and American oak barrels for 18 months. The result is an elegant wine with a memorable bouquet of raspberries, crushed violets and anise and multiple layers of fruit and spice flavor and a long smooth finish that would harmonize well with fare ranging from pasta to poached salmon to blue-veined cheeses. 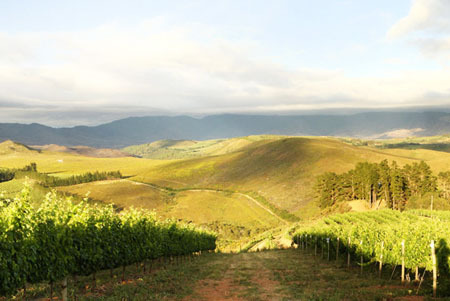 Try to get over pronouncing the name (boo-ken-hotes-kloof) and the rather contrived meaning of its name (the cliff where the Cape beech trees once grew), because they make a number of sensibly-priced, spectacular wines here. For example, there’s the 2011 Chocolate Block ($30), mainly a blend of syrah, grenache and cabernet sauvignon with smaller amounts of cinsault and viognier, that has a bouquet of ripe raspberries, with a long lasting taste of plums, blackberries and earthy spice that enhances the flavor of fare ranging from hamburgers and pizza to steak and lamb. Another winner is the 2010 Cabernet Sauvignon ($50), reminiscent of top-rated boutique California cabs, like those from the Grace Family and Screaming Eagle— with a bouquet and mouth-filling taste of black currants and undertones of butterscotch and exotic spice that go perfectly with rich beef dishes, like braised short ribs. Even the whites, like the light, fruity Wolftrap, a blend of viognier, chenin blanc and grenache blanc ($10) and the elegant, refreshing 2011 Semillon ($30) are heads and heels above the seemingly endless array of homogenous, characterless semillons, especially those from South Africa, on many shop shelves. 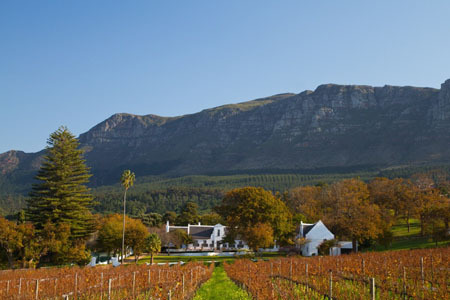 Winemaking started in the 17th century in the Constantia region as part of the commercial effort to re-supply the ships stopping at the Cape of Good Hope on their journey between Europe and the Far East. 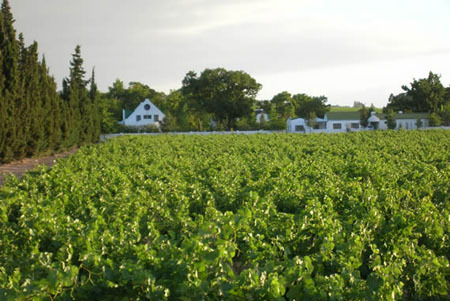 And Klein Constantia (meaning “small Constantia”) was part of the original wine estate developed in the area. 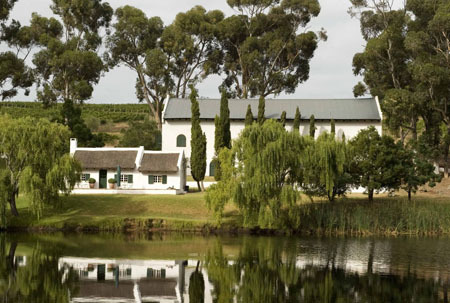 While this locale has become somewhat overshadowed by Stellenbosch and Franschhoek, some excellent wine is made here especially the legendary sweet, honeyed Vin di Constantia. A favorite of Napoleon, known to have had this wine sent to him while he was in exile in St. Helena and who is said to have requested a glass on his deathbed, Constantia is still produced from vine-dried Muscat de Frontignan grapes. The 2007 version ($40) has a deep amber color, with a bouquet and sweet memorable taste of honeyed oranges and apricots with a touch of acidity in its finish that makes it a fine match-up with goat's cheeses or desserts like chocolate mousse and apple pie.